When Paper Darts was introduced to poet Anis Mojgani at the 2012 AWP Conference, we knew we were in the presence of greatness, just not in the position to worship appropriately. Here, for your reading (and our bragging) pleasure is our sacred offering of questions to this two time National Poetry Slam champion—and his godly gift of answers. Paper Darts: How did you come to be involved with Write Bloody Publishing? 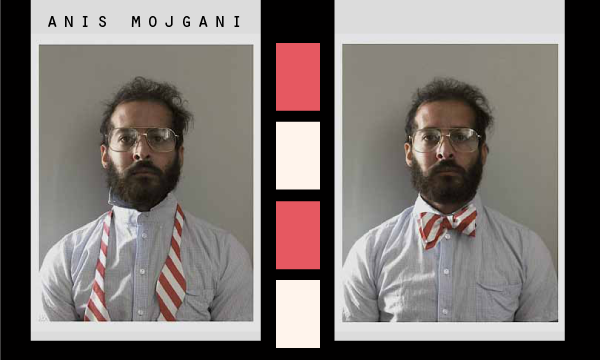 Anis Mojgani: I first met Derrick in 2006, when we did a feature together in Chicago. We had a number of mutual friends and I had heard of his work for a spell. We and some other poets started a tour in 2007, which came to be known as the Poetry Revival. Derrick had started Write Bloody a few years prior and was starting to expand its catalog. At that time I had a manuscript which was sort of in publishing limbo, and Derrick was interested in putting out a book of mine if I was game. I was, and so I put together a manuscript titled Over the Anvil We Stretch, submitted it to him, and they published it in 2008. How do you relate to this? AM: I love what Chuck Close has to say here! I completely agree with it and wholeheartedly relate to it. When I was younger I found more direct inspiration. Inspiration that would directly lead to a poem or painting, but even then most of the longevity of the work and the outcome of the product would come from being inspired by being present in the moment of creating. My process for writing is primarily based on getting out of the house, sitting somewhere to write, and then seeing what comes out. Sometimes nothing does and I spend three, four hours at the coffee shop with a sentence and a lot of time wasted on Facebook and Wikipedia. 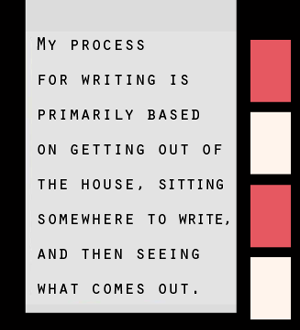 But I feel that is often, unfortunately, part of the process—putting in the time, making myself available for the writing to come. Punching the clock, so to speak. When the work does come, it’s then a matter of being observant and open to what may excite me or what patterns may emerge and to then follow them and shape them into something that may become more solid. I liken my creative process to running down a hill. The more I run, the more my speed is taken out of my control and controlled by gravity implementing itself on the force of my kinetic energy. The more I write, the more I can write. I am inspired by the act of writing and pushed by it itself to continue forward.